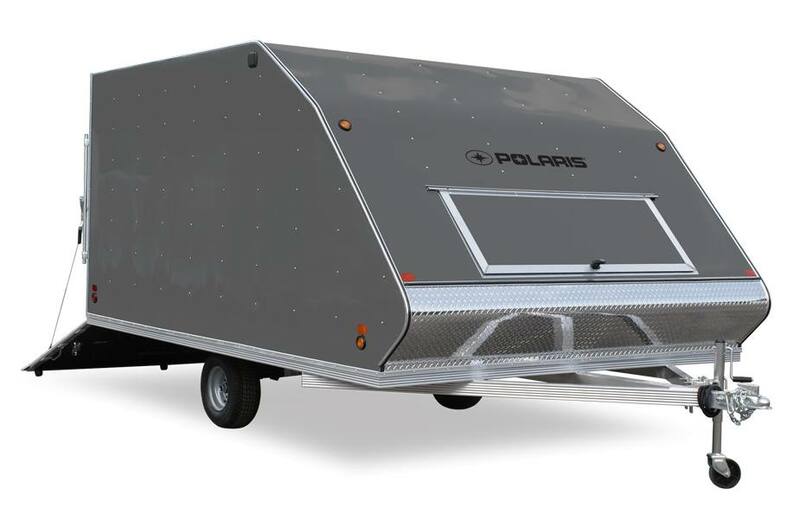 Polaris All Aluminum Crossover Snowmobile Trailers offer both the simple and easy convenience of an Open Snowmobile Trailer with the storage and protection of an Enclosed Snowmobile Trailer. Our All-Aluminum Hybrid Snowmobile Trailer features 5/8 in. Advantech™ decking, a 12 in. plywood kickplate, an interior dome light, 10 in. or 12 in. powdered coated wheels, and a round radius diamond plate nose. Like all our Snowmobile Trailers, you can upgrade and customize your Crossover Snowmobile Trailer with various options and accessories. Box: 12 ft. x 101 in. x 66 in. Overall: 16 ft. 2 in. x 102 in. x 7 ft. 8 in. Interior: 11 ft. 10 in. x 98 in. x 64 in. Subframe Tubing: 2 in. x 3 in. Rear Door Opening: 93 in. x 62 in. Safety Chains: (2) 5000 lb.